This inflatable chair will provide hours of splish splash water fun for kids. Perfect for pool, lake and ocean water playtime. 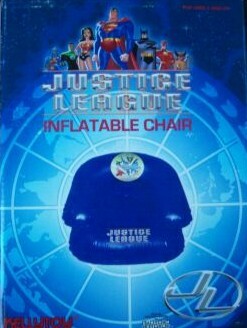 Dark Blue color with multi-color Justice League logos on seat and backrest, featuring all of JL characters including Wonder Woman, Batman and Superman. Official Warner Brothers licensed product.